Everyone in the world is drawn to some sort of art. There are so many different kinds, from paintings to music to clothing to photography and the Art Gallery of Ontario showcases for us in Toronto a huge selection of these different genres of art and different pieces of art through their displays. Whether you knew it or not, the AGO is also a wedding venue. Catering to the people who are drawn to the world of art their Frank Gehry designed building contains in it so many wonderful lines and curves which makes it one of the most distinguished art galleries in North America and a perfect place to host a wedding for an art minded bride and groom. There are a slew of choices of room sizes and styles at the AGO where you can entertain your guests, your bridal party, bridesmaids, groomsmen, flower girls, ring bearers, mother in laws and grandparents including the Baillie Court, Walker Court with it's spiral staircase, Galleria Italia with it's wall of curved windows and wood, Sculpture Atrium, and Member's Lounge that you are certain to find the right unique space for your big day. We love being Art Gallery of Ontario Wedding Photographers due to the incredible amount of photo locations in the venue. 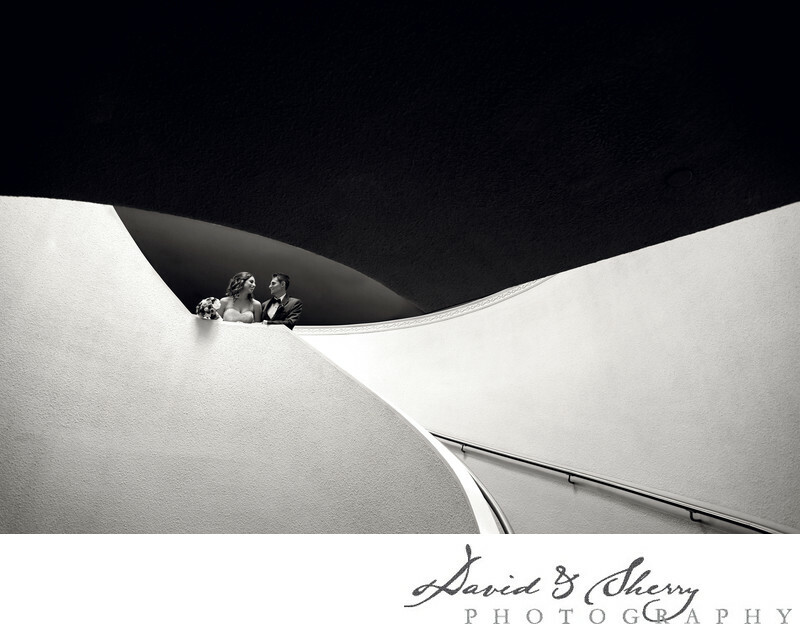 Because the building was a masterpiece of design and a big part of photography is design it is our privilege to walk the hallways and galleries to find interesting angles along the staircases, windows and open spaces to focus attention on our married couple and compose an image that blows people away. It is one of the best venues in the GTA because of it's unique features and we photographers get to create from what has come before us. Taking bridal party shots and group photos with beautiful light coming in the window or capturing Rembrandt lighting on the face of a bride in her Vera Wang wedding gown while she wears her Manolo Blahnik shoes and Tacori diamonds while her something blue is a highlight in her styled hair is something we see great value in. Wedding portraits with the bride and groom together showing it's romantic side along the long wooden window frames is something that will fill a wedding album with the most beautiful story of the emotion of two families coming together to be one. We love creating moving artistic black and white wedding photos as well as striking and colorful full colour images. Location: 317 Dundas St W, Toronto, ON M5T 1G4.